The RV/MH Hall of Fame and TwoFeathers Restorations & Design have come together to offer the RV/MH Traveling Museum. This is a new aspect of the RV/MH Hall of Fame Museum. We are bringing together the knowledge and expertise to bring to you a Unique opportunity. Our fleet is a collection of unique and rare campers. Our campers (Unit) are either restored or in original condition. We will have a complete list of available units available for display as well as vehicles that can complete your display. Some campers have period accessories to compliment each display. Each display Unit will have a display sign explaining the Unique History of that unit. Each display will include a banner display     (approx. 3'x6') will be included that talks about our main museum location in Elkhart, Indiana. This banner will include our list of sponsors at the base of the sign. Display space required: 20’x30’ Choose from campers listed above or you can have our 1930 Model A Ford Truck pulling the camper. Display space required: 40’x30 approx. You would have all three currently available units. 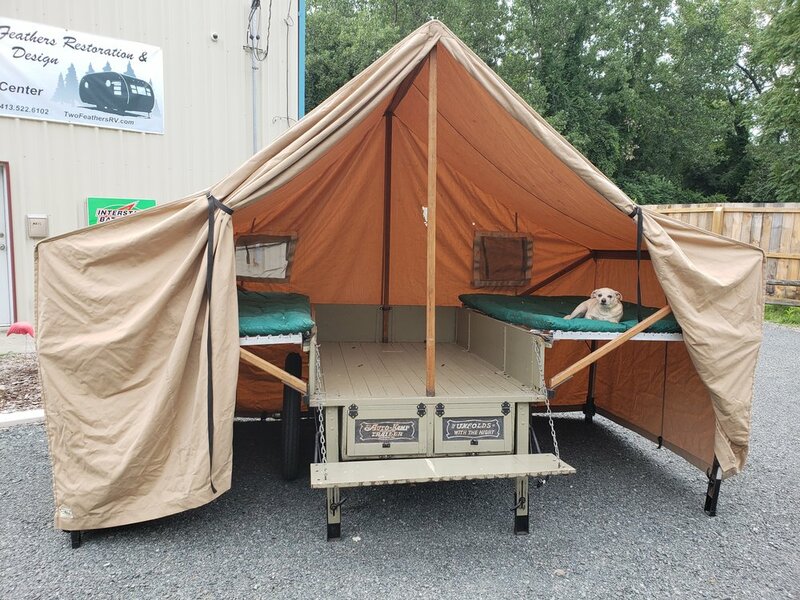 Trailers include some display items such as: Camp stove, lanterns, Tables, chairs and cook pans that are correct for tent trailers of their time. We are a Family run business founded on the idea of providing owners of Vintage Trailers, Tiny House and RV owners a Source of Parts as well as Service to keep Their Trailers in top notch condition. Call Snyder's at 888.262.5712 for all your Model t and a parts needs! TwoFeathers can restore your trailer or customize your Rv to your needs. IF your looking for a new custom unit. They can do that to. Call them today! This is a great opportunity for you to sponsor the preservation of vintage campers and vehicles that tow them. Give support to our efforts and the museum by sponsoring this cause. Your donation is tax free as the museum is a 501c3 non profit.